“Parades are marvelous things, but who has time for such frivolous behavior with all of the preparation Thanksgiving demands?” chimed Ms. Prattlematt, dashing the Mayor’s excitement for a brief moment. The proprietor of Woodrow’s Five & Dime hadn’t been listening and was quite glad when another member of the council stood up and spoke. “If that’s all you called us here for, I’m leaving,” said Percy Radford in disgust. “I’ve got a business to run. You and your schemes! Ms. Prattlematt, if you’ll excuse me,” he added as he bowed to the only lady present. When the door closed behind them, the Mayor looked hopefully at the remnant of the Town Council. Woodrow avoided eye contact, Sheriff Whitaker gave a vacant smile, and the Reverend Crane peered over his wire-rimmed glasses with a scornful expression. He did. He truly did. Even after the three of them petered out of his office, he still thought it was a good idea. So the feisty mayor dug his in heels and planned it himself! He made calls and arrangements that no one understood. He tried unsuccessfully to rally his people around a strange vision no one besides him could see. He viewed himself as a pioneer and knew that on the day tourists pour into the streets of Portsong to see the parade, he would be hailed a hero and his legacy etched in stone. 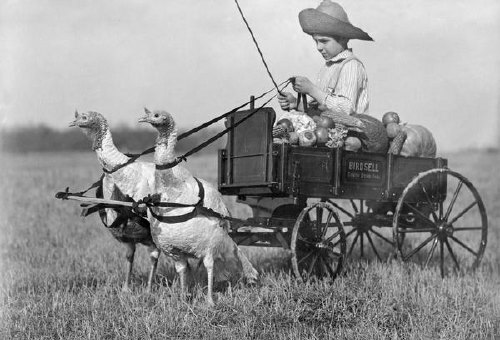 Alas, when Thanksgiving came, the streets were lined with three people who watched Otis Hoskins ride a strange little cart pulled by turkeys. As it turns out, the crowd was simply the rest of the Hoskins family. An odd collection of souls, this was a sort of Thanksgiving tradition and they quickly left downtown once Otis got the turkeys to move. His parade an utter failure, Mayor Shambley ate himself into a stupor that afternoon and went to bed early, disappointed but full. Yes, both New York and Portsong had a parade in the year 1924. Only one followed up with another in 1925. The current citizens of Portsong would like to wish you a Happy Thanksgiving. Thank you Kate…rainy day here too – what’s left to do but write?